You can find some of the latest events around the club here. During the Local Club Evening on April 19, 2018, Holger (DL5KUT) gave a presentation about the preparations of the WRTC 2018 (World Radio Team Championship), a 24-hour amateur radio competition that takes place every four years and will be held this year from July 14 to 15, 2018 in Wittenberg in the northeast of Germany. Holger showed two presentations and gave an insight behind the scenes with some photos. Four members brought their handicrafts to the DIY competition during the local club evening on 15 March 2018. In a small circle of only eleven people, the participants each presented their projects for five minutes before the vote. First place this year went to Andreas (DC4AB) for a small WiFi controllable box clamped between the segments of a shortwave wire antenna to extend the antenna by interconnecting the segments. The second place went to Johanna for an assembled robot kit that uses an analog circuit to draw a black line. 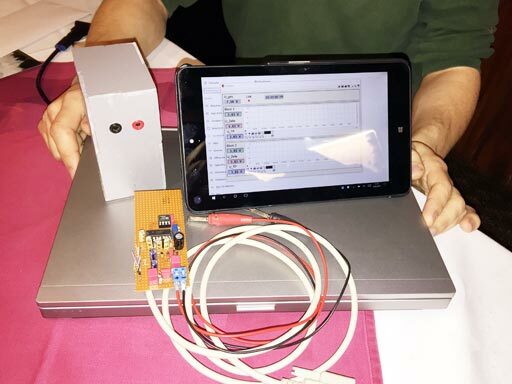 The third place went to Holger (DL5KUT) for the antenna analyzer kit for shortwave antennas and to Marc (DM1MF) for a noise generator on a breadboard with a connected sampler in the form of an RTL SDR USB stick for measuring filters in the range between 500 kHz and 1900 MHz. 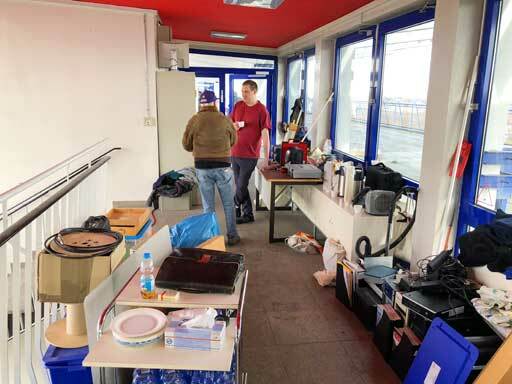 On Saturday, February 17, 2018 Andreas (DC4AB), Manfred (DH9EO), Dieter (DL2GK), Michael (DL5JS), Holger (DL5KUT), Udo (DL5UI), Marc (DM1MF) and Robert (DO7II) met to clean up the club station DL0DX. In six hours, all equipment was removed from the station into the corridor, and the station was vacuumed and cleaned. The opportunity was taken to dispose of parts that were no longer needed or defective. Afterwards all cables were laid new and neatly and all devices were assembled and connected again. To strengthen the helpers Robert (DO7II) had prepared a large pot with hot goulash soup and brought it with him. Parallel to the spring cleaning, Andreas (DC4AB) and Manfred (DH9EO) installed a cable duct in the outdoor area, which leads from the station to the centre of the roof and connects the outer box for the Hamnet technology mounted there with the station. Udo (DL5UI) installed a surface-mounted fuse box with lightning protection devices for power and network on the station wall, which supplies the Hamnet box with power and network in a flash-proof manner. 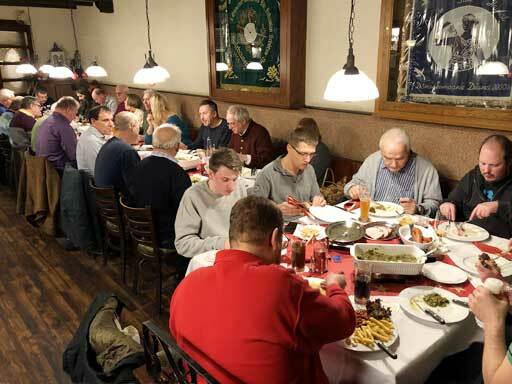 This year, 34 people followed the invitation to the traditional kale dinner during the local clubs evening on December 21, 2017. In addition to many members of R01, as well as their relatives and friends, there were also members from the neighboring local clubs, for example from R04 Hilden, R09 Neandertal, R12 Neuss, R22 Dusseldorf-Lohausen and R24 Haan. Although the planned extension of the restaurant this year was completed, but due to a missing acceptance of the fire department it was not yet possible to use it. That's how it got cozy. The very tasty kale with meatballs, mettwurst and slices of smoked pork chop tasted excellent again. After the meal, the participants took the opportunity to exchange ideas with each other. Finally, the chairman was allowed to distribute a practical cloth bag with a homemade 'DARC R01' print for everyone as a small present. 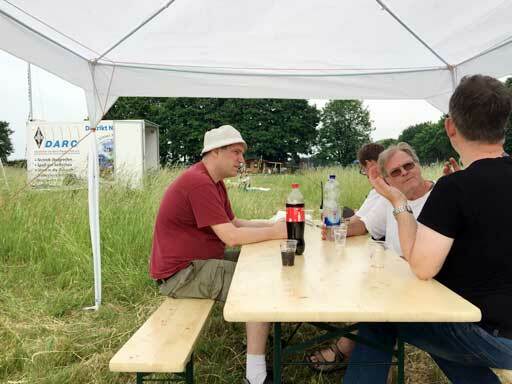 Unlike the previous CW fieldday, adjacent to a feast day, on the first weekend of September 2017 plenty of fellow campaigners got together, who assisted in the construction and dismantling in Düsseldorf-Hubbelrath for the 24 hours IARU region 1 SSB fieldday under DL0DX/p, and also regularly alternate operating the radio. Stefan (DB1KL), Andreas (DC4AB), Manfred (DH9EO), Oliver (DK7TX), Agisilaos (DL1CNY), Dieter (DL2GK), Holger (DL5KUT), Hans-Georg (DL6WA), Marc (DM1MF), Daniel (DM3DA), Christoph (DO4TIF), Eric (DO6PA), Robert (DO7II) and Burkhard (DO8EW) were involved. By this we could work in pleasant three-hour shifts, each with one operator-man and one guard-man. The role of the guard-man was to be with the operator-man in the field (which is especially important at night), to handle the physical well-being of the operator-man and to make sure the generator is filled with enough fuel. Because of the good experience, the leased, sound-insulated, very economical power generator with downstream inverter was used again. For the entire weekend, the barely audible generator consumed just less than 16 liters of gasoline. 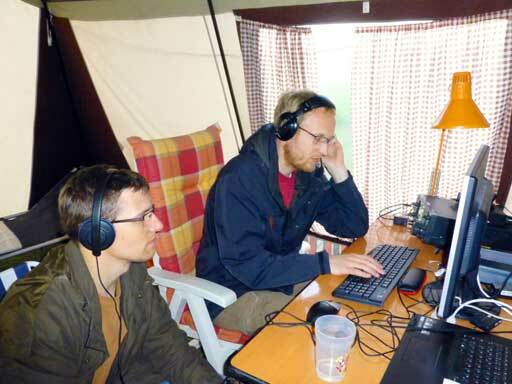 In addition to the shortwave station inside the ristrict R radio trailer, a caravan and the nocturnal lights were also connected to the generator. Fortunately, two antenna masts from formerly British military stock, which are already familiar to us, were not needed for their primary determination at this weekend and could be lent to us and between them we could comfortably span the shortwave dipole antenna. Even this year to the IARU Region 1 SSB fieldday 2017 the local club R01 was on air again with its contest station DA3X/p. This time the station was build up at the "Schäl Sitt" (Düsseldorfer dialect für 'suspicious side') in Neuss Uedesheim. Operators were Maximilian (DB1MC), Rudi (DL1EHR), Michael (DL5JS), Dieter (DL6EZ) and Mirko (DM1EM). The 570 submitted QSOs in the class "portable, multi operator, low power, non-assisted" were enough to reach the seventh place in Germany and the first place in the district Nordrhein. The CW fieldday weekend on June 03rd and 04th 2017 directly followed Whit Monday, a holiday. Presumably for this reason, initially only a few members were found who wanted to or could participate in construction, radio operation and dismantling of DL0DX/p. But then came Andreas (DC4AB), Manfred (DH9EO), Fabian (DL1KID), Dieter (DL2GK), Kai (DL3EAZ), Holger (DL5KUT), Hans-Georg (DL6WA), Marc (DM1MF), Daniel (DM3DA), Eric (DO6PA) and Robert (DO7II) together in Düsseldorf-Hubbelrath to participate in the CW competition. The result of this effort was with 652 established QSOs the eighteenth place among the German stations of the class "portable, multi operator, low power, non-assisted". A better placement reached the participants under DA3X/p. Rudi (DL1EHR), Michael (DL5JS) and Dieter (DL6EZ) achieved with 893 set QSOs the thirteenth place in the same class. 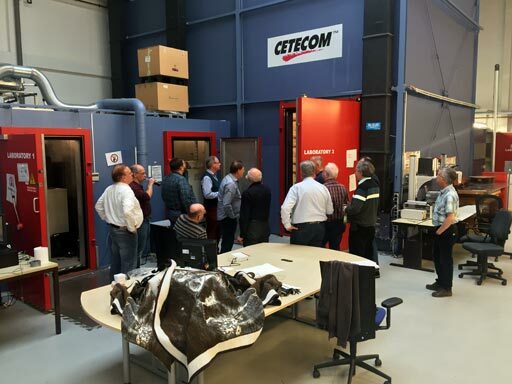 Usually there are no visits by outsiders at the Düsseldorf site, but the company CETECOM invited us to inspect their test lab in Düsseldorf in the afternoon of April 21, 2017. CETECOM is a globally operating company, which primarily offers testing services in the communications industry. 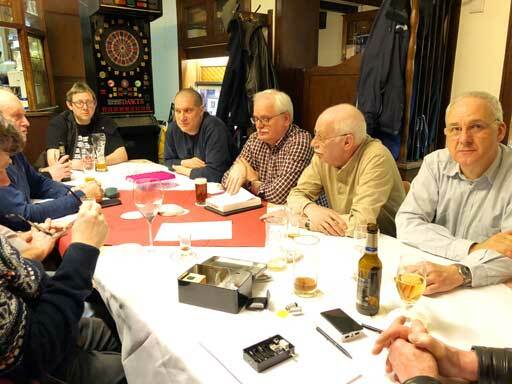 Because the members of R01 Düsseldorf did not cover all of the available participants, some members of the neighboring local clubs, R09 Neandertal, R12 Ratingen and R22 Düsseldorf-Lohausen, also had the opportunity to follow the invitation. Thus 15 persons met to listened to the extraordinarily interesting and lively performance of Peter (DL2EAM) and Volker. Practical examples were presented to the participants in the broad field of activity of the company and the test laboratory, in which products with integrated radio technologies are tested (and occasionally destroyed) before launching the market. Comprehensible to all, the intermittent interference emissions of an LCD TV were measured and a DVD player was tormented with voltage spikes from the power supply of more than 1000 volts and voltage strikes in the kilovolt range on the equipment housing. All these are tests that a device must pass before sale. In about two and a half hours, the employees reported on typical experiences with electronics suppliers and, most of all, about outstanding impressions of the past years. In the buidling coffee and cold drinks were ready, and in relaxed atmosphere some participants tested, how much radio reception their mobile phone still indicated in the HF-dense test room. One of the participants summed up: "They both did very well, and I realized very quickly: They know what they are talking about. Anyone who did not take part in this tour missed something!" - A big thank to CETECOM for the hospitality and the granted insights. On our local club evening in March 2017 our annual self-construction contest took place. There were 18 people, five of them had brought a self-made project. Each project was shown and presented for five minutes. Afterwards, there was time for the attendees to look at the projects more closely and to learn more details. Subsequently, all attendants were allowed to distribute winner points. This year, Maximilian (DB1MC) landed on rank 1 with a battery with built-in electronics for charge control and unloading protection and a PLC communication board for the self-written evaluation software. Rank 2 reached Marc (DM1MF) with a capacitance measuring module for (unlabeled) SMD capacitors. On the third place came Johanna with an assembled kit-board pair with an amplitude-modulated LED transmitter and a receiver. These three places were awarded with a voucher each. Other projects were a polyphonic melody circuit board with Atmel chip by Andreas (DC4AB) and a component collection for a frequency synthesizer of Vladimir (DL7PGA). At the end, Andreas (DC4AB) presented a quantum-physical experiment with an air balloon, which warms up during entrainment and cools down noticeable by entropy when it re-contracts. 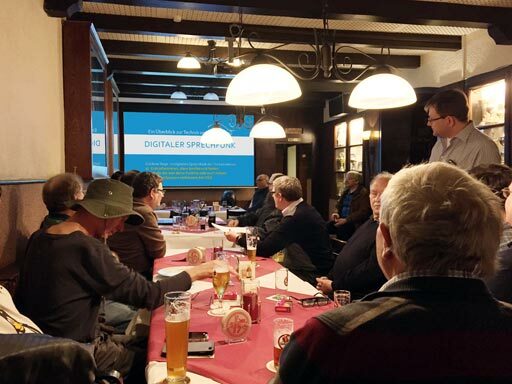 Presentation by Klaus (DL5RFK) about "Voice radio with DMR"
On the local club evening on 16 February 2017, Klaus (DL5RFK) gave an interesting lecture on digital operating modes. The focus was slightly on DMR, compared in detail with C4FM and D-Star. He figuratively explained typical terms like 'Timeslot' and 'Talkgroup'. He also described the connecting networks behind the operating modes and reported on their emergence and the attempts to connect these networks. Finally, he showed the mobile and portable devices and the commercial and self-built repeaters and home entrances, which are currently available in the market for each operating mode. Klaus was supported by Klaus (DC6CM) and Jean (DG4IX) during his approximately 50-minute talk, which also brought along a few portabel devices and an user entrance to try out.